BIRTHDAY PARTY, OPEN GYM and FIELD TRIP information. Are you looking to have an exciting, yet stress free birthday party? Check out our birthday accommodations! Do you also have a child that is interested in high energy play? We have Open Gym time for ALL ages and an Open Gym designated just for Toddlers. We also are available to host a Field Trip for you! $100 Member /$ 125 Non-Member for 12 children. $5.00 EXTRA, per child over 12-Max of 18 children. 2 hour reservation. Choosing OFF SEASON SPORTS ACADEMY as the host for your special birthday party is an honor to our Staff! 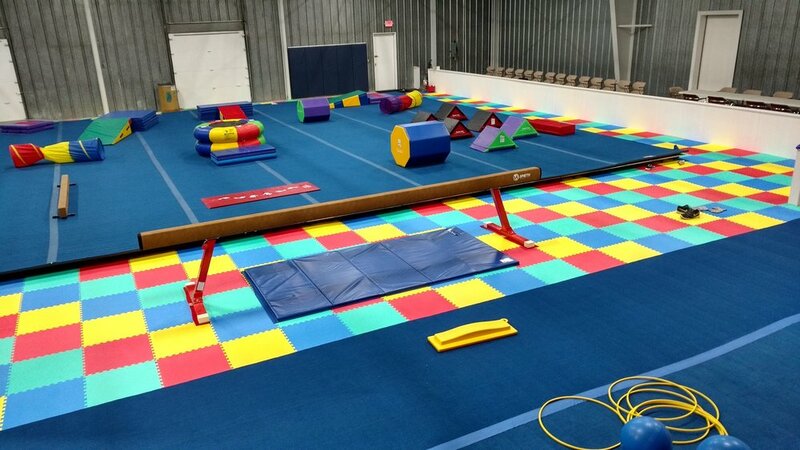 Your group will have access to the gymnastics area for a fun filled time of play. Leaving time for opening gifts and blowing out the candles. We provide table cloths along with set-up and clean-up. You are welcome to bring food, cake & ice cream and drinks. Let us know what type of Party you would like to have: Open Gym style, Obstacle Course style or you now have the option for a Nerf Gun party. You bring the Nerf Guns and the ammo and we’ll set up a fun course for you to play on! Come enjoy open mat time with your toddler. This open time is for younger age kids to create a safe environment for crawlers and beginning walkers to explore while our more advanced toddlers climb, hang and tumble on our equipment! We ask that no kids over the age of 5 attend this open time. We have other open gyms for our older, more advanced kids. Come enjoy open gym, where you can spend time practicing your personal skills or just to burn off that extra energy in a safe environment. If your child is under 4 years old, we ask that the parent assist their child in the tumbling area for extra safety measures. Bring your own Nerf Gun and bullets and have some fun during Nerf Gun ONLY Open Gym! You’ll get to work your way around an Obstacle Course while trying not to get hit. We’ll play some games too for those kids that like to compete! Safety glasses are highly recommended if you have a pair to wear. NO ball guns allowed. (recommended age is 4 years old +) THIS IS A SPECIALTY OPEN GYM AND IS TYPICALLY ONLY HELD ONCE A MONTH. This Open Gym is exclusively for Homeschooled children to give them an opportunity to get some physical activity during the school week! Come enjoy Open Gym where you can spend some time practicing your personal skills or just to burn off that extra energy in a safe environment. ALL Ages are welcome. If your child is 4 years old or younger, we do require a parent to stay with the child while participating. THIS IS A SPECIALTY OPEN GYM AND IS TYPICALLY ONLY HELD ONCE A MONTH. Our gym is a fun and safe venue for team building, youth group fun, or a private place to bring your team to work on form and fundamentals. You can reserve table & mat space at our facility to meet your needs. Max of 24 guests. Available in 1/2 hour increments-cost will be based on parent/student goals. We can host several kinds of field trips from open gyms to organized activities. The children can do obstacle courses, walk on the balance beam, hang from the bars, jump on the tumble trak & do some tumbling. You'll get the whole gymnastics area to yourself! Please Note: If less than 10 children are able to attend your scheduled Field Trip, a minimum of $50 will be required to be paid. No current coupons/discounts that we may be currently offering can be applied towards the cost of the Field Trip. A $50 deposit is required to be made 1 week prior to your scheduled event. Additional costs, if more than 10 children, can be paid the day of the scheduled Field Trip. A Liability Waiver is required to be signed for each child attending the Field Trip. TO RESERVE A DATE FOR A FIELD TRIP, PLEASE CALL US AT (231)648-6266 OR EMAIL KELLY AT: kelly.offseasonsports@gmail.com. TO FIND AVAILABLE DATES, PLEASE CLICK ON THE BUTTON BELOW. IF YOU ARE INTERESTED IN A DATE WE DON'T HAVE LISTED, PLEASE CONTACT US FOR AVAILABILITY.